No one loves fall more than a mom. As summer leaves us, so do 100 degree playdates, trying to entertain your kids all day, every day, and all those fun yet exhausting summer commitments. Fall brings us sweater weather, the social acceptance of yoga pants as morning and evening wear, boots to cover un-pedicured toes, and fun fall hats to hide greasy roots. But most importantly, fall means the kids are back in school…I mean it’s Pumpkin Spice Season! Ahhh Fall. My favorite of all seasons. But fall does have one downside, the crazy school mornings of getting everyone fed and out the door on time. Well, I’m here to help. It’s a gloomy October morning here in SoCal and we’re embracing all of its laziness. The 2 month old is asleep in the glider and the 4 year old is fighting bad guys in undies, just your typical “boy mom” morning. Except it didn’t quite feel like fall yet. There was no PSL in my hands, no pumpkin bread on my counter, nothing besides the weather felt fall-ish. Then I remembered a granola recipe I found on Real Simple a while back that was filled with coconut and mango and all their summery goodness. 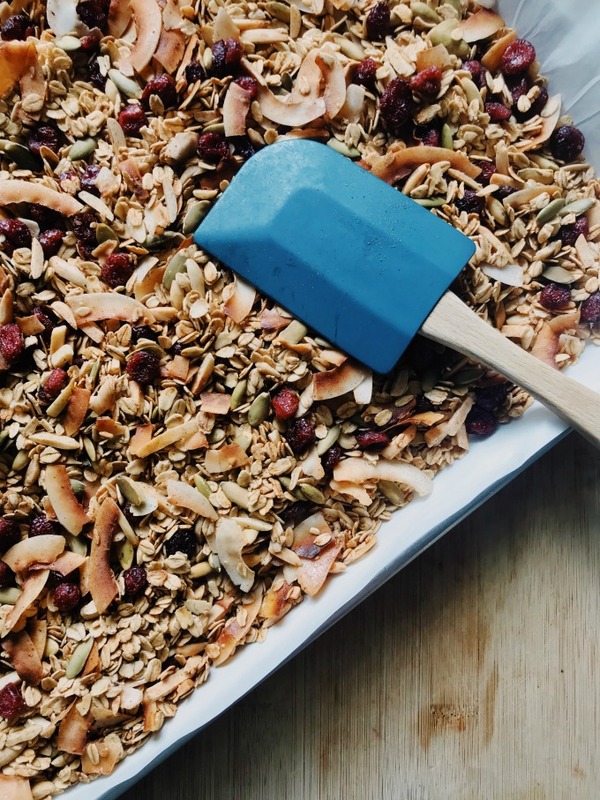 Why can’t I put my spin on a granola to encompass all of fall’s pumpkin spice goodness? Perhaps with coconut for those still not quite ready to let go of summer? So I did, and I’ve got to admit it’s pretty damn good. Not only is it a big-batch recipe, so you’ll have plenty on hand for last minute breakfasts, snacks, and treats, but it’s healthy and homemade. Serve up some to you or your kiddos with milk, or in a parfait, sprinkled over cut fruit, as an ice cream topping or just by the handful. 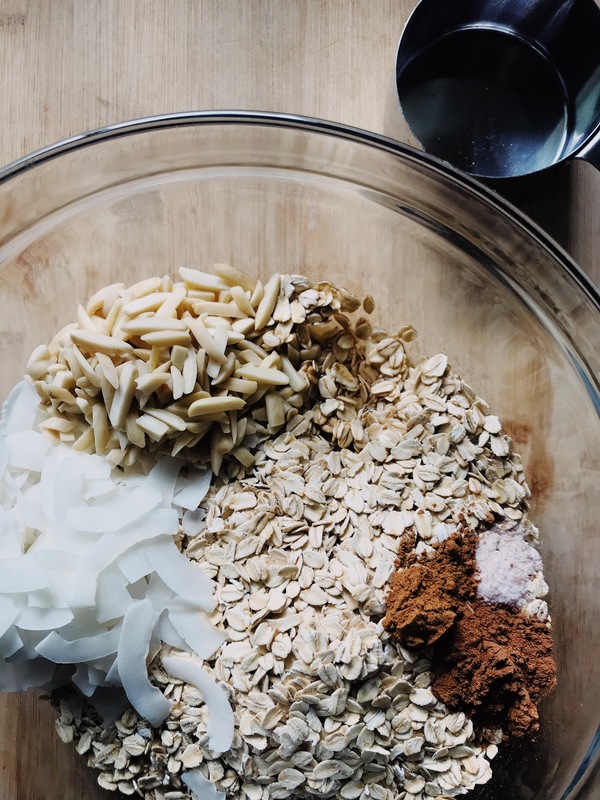 This quick and easy coconut pumpkin spice granola recipe not only fills your home (and belly) with the smell of warm spice and toasty coconut but it’s only 10 ingredients, vegan, gluten-free, refined sugar-free, and a one-bowl cleanup job. Now rock on you domestic goddess! 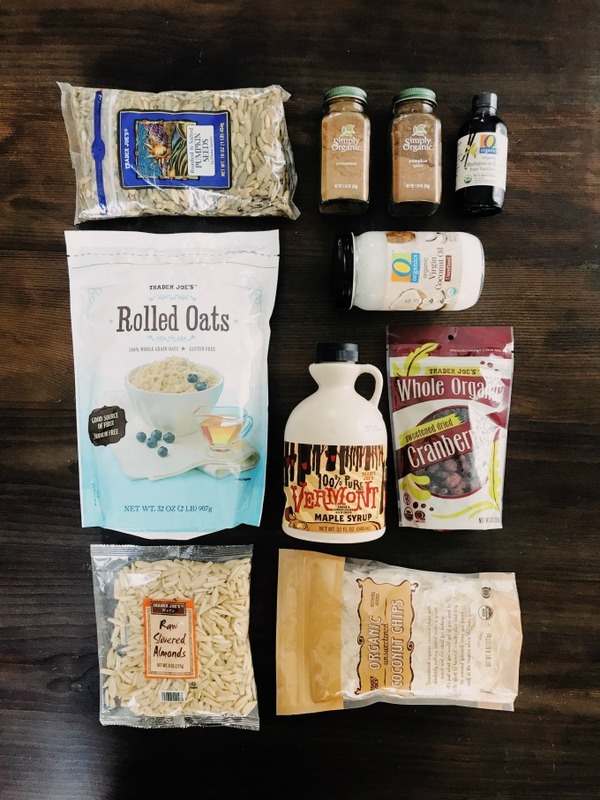 Mix together well the oats, coconut, almonds, maple syrup, coconut oil, salt, pumpkin spice, cinnamon and vanilla. Spread on a parchment lined (no clean up!) baking sheet and spread evenly across. Bake for 25-30 min tossing halfway through. When done, add cranberries and pumpkin seeds, toss well and let cool for 20 min. Store in an airtight container for 4-6 weeks.